Carry the natural beauty of wood from your furniture to your window coverings. 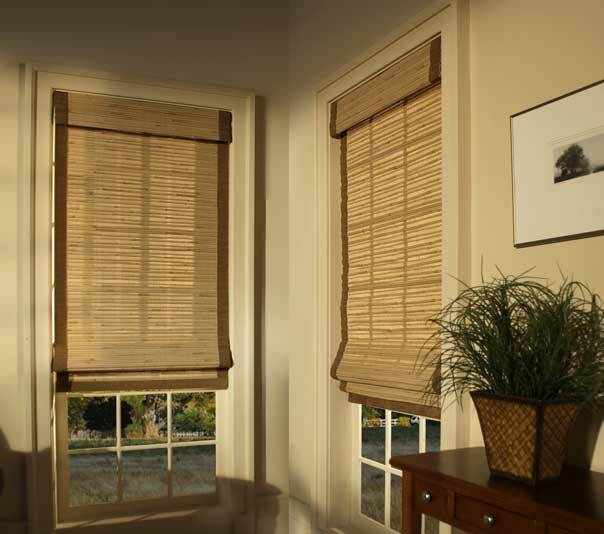 Rich in character, there is a WOVEN WOOD BLIND that is just right for every style and decor. Come and see our amazing selection of this beautiful window covering … photos just don’t do justice to the variety of textures, designs and colours that nature has provided for us and man has enhanced. Select from a full range of open to private weaves with some a perfect coordinate with venetian Wood Blinds. Insulate your windows by adding custom Linings up to Blackout level in light and temperature control. Take advantage of our Roman Shade Blind’s “Top Down – Bottom Up” feature for further custom light and privacy control. Available in Roman Shades, the Avertefold and Sliding Panels, there is a Woven Wood Blind and style perfect for your setting. Customize your Woven Wood Blind by binding the edges with Fabric and you can coordinate your room’s Woven Wood Blinds with Drapery, Side Panels, Valances and Cushions in the same Fabric. The Avertefold drape is another great solution for your French and Patio Doors. From sliding one way to dividing in the centre, this great Woven Wood sliding Blind design can easily coordinate with Woven Wood Roman Shades or traditional Wood Blinds. Available also with Privacy or Blackout Lining, customize your Avertefold to both control visibility and insulate you from heat or cold.